THE ringgit’s slide to as low as 3.6295 against the US dollar over the past few months has reignited concerns about the long-term direction of the currency. Many investors, especially those with high net worth, have already been dabbling in currencies such as the Singapore dollar, the US dollar, the British pound and the Australian dollar, which are perceived to be able to retain their values better than the ringgit. But is the ringgit really all that weak, or has negative sentiment outstripped the country’s fundamentals? The fall in oil prices may have exposed the country’s dependence on petroleum revenue and hurt its economic fundamentals, but it is the strengthening of the US dollar that has played a major role in the ringgit’s weakness. In fact, the ringgit is far from alone in its depreciation against the dollar, although it saw the sharpest drop. “There has been a sell-out across all emerging markets’ currencies, but in Asia, we tend to underperform as an oil exporting country, whereas our neighbours benefit from lower oil prices. We are not the preferred destination for investment because we have a lot of negative headlines at the moment,” says Affin Hwang Capital’s head of fixed income Esther Teo. Nonetheless, she notes that “sentiment has run ahead of fundamentals, as it usually does”. “Fundamentally, we’re not doing that badly. Growth is about 4.5%, which is still decent, and inflation is still okay, at about 4%. It’s all about confidence. The government needs to show that it can handle the fiscal deficit and other headwinds,” she explains. The ringgit is often compared with the Singapore dollar, which used to be at parity but has since appreciated far ahead of the local currency. While this currency envy has driven the perception that the ringgit is doing poorly in general, looking back, it has actually held its own against other major currencies. The ringgit had appreciated modestly against the greenback, the Australian dollar, the euro and the British pound over the past 10 years until recently (see table). These gains would have been substantially larger if not for the plunge in oil prices. Nevertheless, foreign currencies have only risen in popularity over the past few years and continue to be so. “Over the years, I have seen my clients invest an increasing amount of money overseas. There is nothing wrong with diversifying your risks by holding different currencies. In fact, it is encouraged. But when investors make the decision based on fears that the ringgit is going to weaken, then they are investing for the wrong reasons,” says Yap Ming Hui, managing director of Whitman Independent Advisors Sdn Bhd. Over the past six months, he says, there has been a surge in demand for non-ringgit investments. He estimates that his clients have typically moved at least 20% of their investible wealth overseas. However, investment in non-ringgit-denominated assets easily makes up more than half of clients’ portfolios, he adds. Another financial planner, Robert Foo, estimates the figure to be higher, with some high-net-worth clients investing up to 90% of their wealth in foreign assets. “How much money a client invests overseas depends on his wealth. The richer clients tend to be able to invest a larger percentage of their money abroad. On average though, most clients tend to keep 20% to 30% of their wealth in ringgit,” he says. It is difficult to say how well investors who diversified abroad have performed because portfolios vary wildly in currency and asset types held. But even investing in Singapore dollar-denominated assets is not a straightforward upwards bet although the currency’s performance may indicate otherwise. 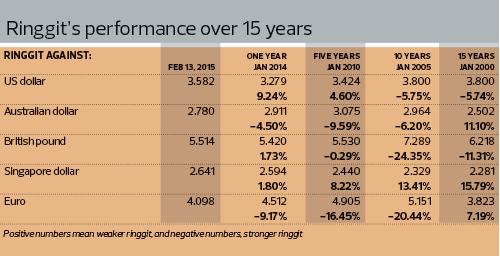 Over the past 15 years, the Singapore dollar has appreciated 17.5% against the ringgit. This figure looks impressive, representing slightly over 1% compounded per annum — a substantial amount nonetheless, but mostly offset by the difference in interest rates between the two countries. Singapore’s fixed deposit rates currently average 1.25% against Malaysia’s 3.25% or more. On top of that, the Singapore dollar is not without its own risks. The Monetary Authority of Singapore uses the exchange rate as its main monetary policy and a recent unscheduled announcement that pointed to monetary easing saw the Singapore dollar cool. A Bloomberg News survey anticipates a 3% slide in the Singapore dollar against the greenback going forward. Meanwhile, Singaporean equities have not been particularly impressive either, at least not when compared with Malaysian stocks over the past five years. It has not been a particularly good year for the local benchmark index, but it has still managed to gain 46.65% over the past five years. In comparison, Singapore’s benchmark Straits Times Index rose 24.37%. Even in Singapore dollar terms, the local benchmark index still managed a 34.5% gain in the same period. “Singapore is seen a safe haven. It is one of the few AAA-rated countries out there. That is why there is a lot of money going to Singapore. The private banks as well. It is a regional hub for private banking. A lot of investment banks are relocating from Hong Kong to Singapore. It has marketed itself very well as a regional hub,” says Teo, explaining the Singapore dollar’s strength. Interestingly, fund managers like Teo often tap into foreign companies to boost returns on their Singapore-based funds. Chinese and Indian companies listed in Singapore, for example, have been able to generate better returns. Basically, even the funds investing in Singapore are looking at non-Singapore dollar-denominated assets that earn their revenue in other currencies to get better returns. Nonetheless, Yap says the Singapore dollar continues to be one of the most popular currencies among his clients “because Malaysians are familiar with it”. Looking ahead, the ringgit is expected to stabilise as oil prices find a new floor. And even if it falls further, it is not an outright bad thing as long as it depreciates in tandem with other regional currencies to maintain export competitiveness. “I think the government is okay to let the ringgit weaken further as long as it is not in a major disruptive way. Looking at the US dollar’s strength, there is room for other currencies in the region to weaken further,” notes Teo, who expects the ringgit to trade between 3.5 and 3.75 against the greenback in the short term. “At US$45 a barrel, oil prices are closer to the bottom, towards the end of the correction. Between US$35 and US$40 would be the bottom. It will be very well supported at that level,” she explains. She also notes that foreign investors have not shied away from Malaysia totally. “They (foreign investors) still hold more than 40% of our MGS (Malaysian government securities). Why? Because we are living in a low [global] interest rate environment. The ECB (European Central Bank) just did a QE (quantitative easing), and global bond yields will fall even further. As a global fund manager, what can you do? The German Bund is trading at 0.3% and Japanese bonds, 0.2%. So, there is no yield out there … that is why Malaysian 10-year bonds at 4% look very attractive,” says Teo, noting that the yield of 10-year US Treasury today is only 1.75%. What happens when petroleum reserves run out? However, Teo is most bullish on the US dollar going forward, anticipating more upside despite the already strong performance. “The US dollar’s strength is also a result of policy divergence by the major central banks. Europe and Japan easing interest rates while the US is tightening. We have these two major blocks depreciating, and China is expected to cut interest rates as well. When you see all this, there is only one way for the US dollar to go,” explains Teo. Again, this is not without risks. The US dollar rally was momentarily routed in mid-January when the Swiss franc was unpegged from the euro, allowing it to appreciate 25% against the greenback, stunning traders. Moving forward, slower-than-expected economic recovery or a delay in interest rate hikes by the US Federal Reserve will also weigh on the US dollar rally. “If you’d bought the Australian dollar a few years ago when the interest rates were high, at almost 8%, you might have made some money there. But the recent move in exchange rates would have wiped it out,” says Whitman’s Yap. In that sense, Malaysian investors should not be too worried about the short-term volatility in foreign exchange rates when it comes to investing their money for the long term but should look at the country’s changing fundamentals instead. “Malaysia’s fundamentals are not great, but they are not as bad as people make them out to be. But going forward, the question is, where we are headed?” says Teo. Malaysia has been blessed with an abundance of natural resources, but what happens when our petroleum reserves run out? The recent fall in oil prices laid bare the government’s reliance on oil revenue to keep the country going. The growing concern about the country’s education system and the persistent brain drain do not help the situation either. The ringgit’s tumble to 3.6 against the US dollar may be due to, for the most part, external factors. But how the ringgit performs going forward will go back to the government’s ability to inspire confidence in the nation’s economic prospects. This article first appeared in The Edge Malaysia Weekly, on February 16-22, 2015.